Free Pinkberry! Free Pinkberry! Free Pinkberry! Paris Hilton: Omigod! You’ll never guess what just happened! Paris: OK, so I was in my car, on my way to Harry Winston, listening to my album, OK? And it started skipping. I mean, really! That thing never leaves my CD player. Why on earth would it be skipping? So anyway, I pushed the eject button thingie to pop it out so I could look at it, and the radio came on. Paris: So anyway, I found out they’ve got new summer flavors — coconut and passion fruit — and from 5 to 9 p.m. on Friday they’ll be giving out small cups of the new flavors. I totally can’t wait! You know how much I love coconut! Paris: You know I’m at Pinkberry, like, every day. Since you’re my BFF, I’ll pick you up at 4:30 on Friday, I’ll bet we can hit every Pinkberry in L.A., starting with the two here in Beverly Hills. Nicole: Why are you calling me? Nicole: We haven’t spoken in two years! From the Claremont Now blog we learn that ice creamery Bert & Rocky’s is hosting a fundraiser for Kidcare International from 6 to 9 p.m. Thursday (June 25). During the “Scoop for Hunger” fundraiser, Bert & Rocky’s will donate 20 percent of their sales, plus any tips received, to the Claremont-based organization. If you’ve never tried Bert & Rocky’s, this would be a good excuse to check them out. This is a good cause and they make really good ice cream. Bert & Rocky’s is at 242 Yale Avenue, at Bonita Avenue, in Claremont. So, you’ve just had a busy time fighting the SUV-driving weekend hordes at Costco, and those puny food samples haven’t come anywhere close to quelling your appetite. What’s a hungry shopper to do? Well, that’s where the San Bernardino Chipotle Mexican Grill comes to your rescue! For the next two weekends (June 20, 21, 27 and 28), the San Bernardino Chipotle, conveniently located at Tippecanoe Avenue and Hospitality Lane — directly across the street from the San Bernardino Costco — will give you a free burrito when you bring in your Costco receipt. That’s right, a free Chipotle burrito! You know Chipotle…where you decide what goes inside. I usually decide that it’s a veggie burrito bowl with cilantro-lime rice, black beans, tomatillo green-chili salsa, roasted chili-corn salsa, sour cream, cheese and guacamole inside. Yum! The offer isn’t good on fax or online orders, but if you’re shopping at the San Bernardino Costco, all you have to do is walk across the street. It doesn’t get any easier than that. 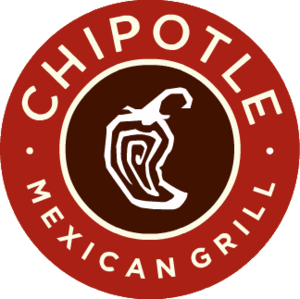 If you haven’t tried Chipotle’s burritos, they’re really good…they’re even worth fighting the Costco crowds for. Free Hot Dog on a Stick! Free Hot Dog on a Stick! Free Hot Dog on a Stick! 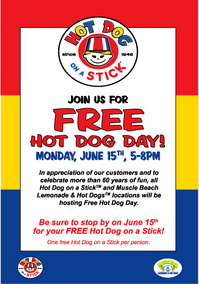 Tipped off by Canan Tasci’s Montclair Now blog, we were surprised to learn that today is free Hot Dog on a Stick day. You would think that would be something we would’ve known about before today. Hmmm. Regardless, you’ve still got time to take advantage of the deal, since the primary color-clad gals and guys don’t start handing out the free batter-dipped dogs until 5 p.m. And they’ll continue to hand them out until 8 p.m.
It’s in celebration of the chain’s founding in June 1946 by Dave Barham, who passed away in 1991. Don’t know if the offer includes their veggie dogs, but it’s definitely one free dog per customer. Inland Empire Hot Dog on a Stick locations include: Inland Center (San Bernardino), Montclair Plaza, Redlands Mall, Moreno Valley Mall, Victoria Gardens (Rancho Cucamonga), Galleria at Tyler (Riverside) and Westfield Promenade (Temecula). If you want to include the deserts, there’s Westfield Palm Desert and the Mall at Victor Valley (Victorville). Five barbecue restaurants, with three new ones in the last year … that’s impressive. It’s like the new frozen yogurt. constantly hungry and poor. Coffee Klatch, In & Out, Pho Ha, Taco Hut, The Deli and Felipe’s are all outstanding. Maybe Joey’s can soon join that list. Once again, our friends at Pick Up Stix have graced our email inbox with notifications of deals. So, we here at Dine 909 are passing them along to you, Our Gentle Readers. And their timing couldn’t have been more perfect, since one of the deals occurs on Tuesdays and the other takes place on Wednesdays. In actuality, the dated deals are extensions of currently-running offers. Tuesdays (after 5 p.m.) brings two chicken entres, steamed white or brown rice and two vegetable egg rolls for $9.99. Wednesdays, you can purchase their cream cheese wontons for only 25, with a minimum purchase of two. No coupon is necessary for either of these deals. However, you can either click here for a coupon that gives you a free entre with the purchase of another, or you can click here for a gaggle (I believe that’s the correct term) of coupons that includes that buy-one-get-one-free coupon and others, including $5 off $20. If you work for a restaurant and want to send us some deals to share with our readers, feel free to email us at dine909@inlandnewspapers.com. The Fraternal Order of Eagles, Pomona Aerie 2215 (“The Biggest Little Aerie in America,” according to their Web site) is hosting a baked chicken dinner K-9 fundraiser from 5 to 7 p.m. Thursday, June 18. All proceeds will go toward purchasing another police dog for the Pomona Police Department. Cost is $7.00. The Aerie is at 954 W. Mission Blvd. 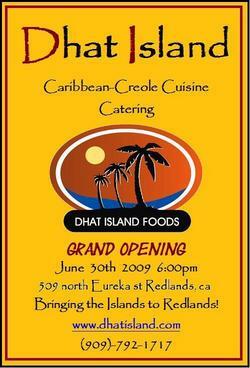 For more infomation, call (909) 622-9160.